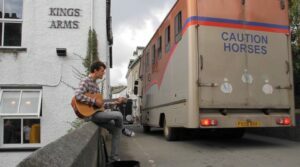 Over the past 30/40 years the number of visitors to Cartmel has increased substantially with the historic 12th Century Priory a visitor attraction and additional days in the horse racing calendar. But the main driver of change has been the emergence of the village as a Cumbria ‘foodie’ centre and, consequently, a destination of choice for visitors and holidaymakers. Simon Rogan’s restaurant L’Enclume, which boasts two Michelin stars, started this trend and the village now also has a high-quality cheese shop, an award-winning coffee shop and a successful micro-brewery. 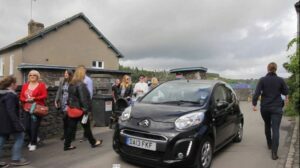 The growth in visitor numbers has led inexorably to a steady increase in the number of private and commercial vehicles entering and parking in the village. Narrow streets and tight corners exacerbate the problem. Acknowledging the increasing seriousness of the issue, the Parish Council has on several occasions attempted to bring in controls but always met resistance from both residents and businesses, compounded by the fact that the village is a Conservation Area. In 2013 the Parish Council resolved to address the issue and a voluntary group of residents and business people embarked on a project called the Cartmel Township Initiative. The aim of the project is the implementation of traffic control measures and regulated parking. Almost £30,000 was raised and a leading Town and Country Planner, Allies and Morrison, appointed. After extensive consultation their Report with Recommendations was published in January 2015. The Parish Council then asked the Group to reconvene and in April 2015 the CTI Delivery Group emerged charged with implementing Actions contained in the Report. Formulating a Traffic Management Programme reflecting the interest of residents, businesses and visitors has not been easy and despite a ‘draft’ being completed by autumn 2015, floods in January meant that the capacity of Cumbria County Council to advance the Order was curtailed. With part benefit of a LIP Grant and monies set aside by the PC, it was agreed to appoint a Traffic Consultant to draw up ‘formal’ plans and in June 2016, Royal Haskonig PLC was instructed and plans eventually agreed with County Highways before being taken to a major Public Engagement September 2016. Following feedback on the proposals from the Community and a further review of options and possible amendments, the CCC were determined to take the proposed Traffic Regulation Order (TRO) to final consultation. After passing through the Committee stage, it is anticipated that the TRO will become operational during 2017. The CTI Delivery Group is also in the process of implementing further proposals with Grant Aid from the South Lakeland District Council including a possible footbridge over the River Eea, low level lighting into the racecourse car park, bicycle racks, improved signage and landscaping along the riverbank etc. The Group has secured additional funding of £65,000 to implement further Actions contained in the Allies and Morrison report especially formalising a temporary ‘race day’ access out of the racecourse car park to Allithwaite Road to help reduce traffic flow through the village as well as dedicated coach parking for visitors on the periphery of the village.